The summer has passed by without much time spent in our garden. It has been too hot here. Last weekend we finally spent some time in the soil and we are the better for it. Did you know that mycobacteria in the soil may help increase our serotonin levels? Is that why we feel so good planting and digging? Always a work in progress, our garden is in a state of upheaval. Piles of gravel, burlap sacks, and plastic sheeting dot the landscape as we remove more grass for paths and garden beds. This past spring, we removed half of our wooden deck and put in two vegetable beds. The remaining deck covers the spot where we plan to put in a small patio and an herb garden, but those projects must wait for cooler weather and for the rain to soften the soil. Our front yard suffers from the high temperatures and lack of rain. We are trying to move drought tolerant plants and natives to the front yard, so we don't have to water that area as much. So everything is a mess. But there are things of beauty in this mess. There are berries, flowers, and herbs. The one thing that always looks spectacular is the garden sage. It is always so green and abundant. Another beautiful thing about our yard is the amount of bees who come to visit. We were especially thrilled this year to see an increase in bee visits after our backyard neighbors set up a hive of honeybees. The bees are a wonder to watch. I rely on honey whenever I feel under the weather, but there is evidence that the lactic acid bacteria found in bees’ stomachs (and also in honey) may protect us from some persistent pathogens. As summer comes to an end, I want to celebrate our work and the bees’ work; to all of the progress we have made. I want to share a technique to infuse raw honey with garden herbs. Honey can be infused with any aromatic herb such as sage, thyme, lavender, mint, rose petals, and horehound. It takes little effort to extract the flavor and medicinal properties of an herb by letting it infuse in raw honey. It is best to use raw honey from beekeepers who are making efforts to protect our pollinators. Infused honey is a wonderful way to preserve the flavors of fresh late summer herbs for winter time enjoyment. A jar of infused honey makes a thoughtful gift and is perfect with tea, hot toddies, biscuits, oatmeal, yogurt, or cheese. I recommend either garden sage, salvia officinalis or pineapple sage, salvia elegans. Garden sage aids in digestion and soothes a sore throat. Be aware that garden sage can dry up milk supply in nursing mothers. Pineapple sage has a mild pineapple scent and may soothe anxiety. If you find pineapple sage in bloom, then use the vibrant flowers too. Please note: The salvia genus is large, and not all members are safe to consume. 1. Fill a clean jar to the halfway point with fresh herbs. For dried herbs, fill a third of the way. 2. Carefully pour honey over the herbs. 3. Use a chopstick or a spoon to push the herbs down below the honey and to remove any air bubbles. Cover with additional honey, if necessary. 4. Cover the jar with a lid. 5. Let the honey mixture sit in a sunny windowsill or in a cool cupboard for a week or two. Both methods are fine, but the warmth of the sun will extract the flavors and medicinal elements faster. Taste the honey after a week and see if it needs more time to infuse. 6. When the honey is fully infused, strain it through a mesh strainer into a clean jar. Straining the honey may take a long time. This soda is earthy and refreshing, and may help soothe a scratchy throat. If you don’t like soda, try substituting hot water for the sparkling water to make a soothing toddy. 1. In mason jar or juice glass, gently muddle the sage leaves into the honey. 2. Squeeze in the juice from the lime quarter and drop it into the glass. 3. Add an ounce of sparkling water and stir well. 4. Add ice and top with more sparkling water; stir gently. The elixir of life is said to contain drops of pure gold. One of the alchemists' tasks was to discover a process to extract an elixir of immortality from something ordinary. I believe that I hold this elixir in my possession. I did not glean it from an ancient text, but from the streets of Tijuana and the internet. Brewing tepache is so simple and easy, and will forever astound you with its riches. I haven’t thought about tepache in a long time. I remember seeing tepache vendors near the collective taxi stands in Tijuana. They sold sticky plastic bags filled with tepache to be sipped with a straw. Now tepache is appearing on bar menus across the country. Here in Portland Reverend Nat’s Cider started bottling a mildly spicy tepache. They produce a limited amount of tepache per year. When I volunteered at the Portland Fruit Beer Festival earlier this summer, I was lucky to land the job of pouring Reverend Nat’s tepache. This was one of the busiest lines at the fest. No wonder, tepache is so tasty and refreshing. What I love best about this process is the alchemy of rinds creating liquid gold. Tepache is made with the rinds of pineapple! Something so tasty from something we normally toss into the compost? Count me in. 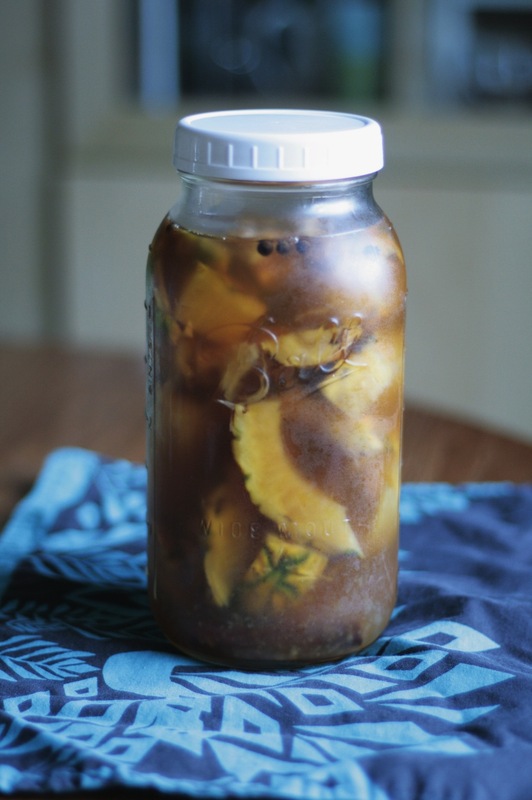 Do what you want with the fruit of the pineapple and save those rinds for tepache. The rinds have wild yeast on them. The only other requirements are: Filtered water, sugar, and a jar. I use tap water, but the chlorine in tap water may inhibit the growth of yeast., so keep that in mind. You can add spices such as cinnamon, cloves, allspice, or dried chiles. The resulting beverage is brimming with probiotics and is mildly alcoholic, ranging from 1 - 5% ABV. - 1 to 1 1/2 cups sugar, depending on the size of the pineapple (I like a blend of muscovado and cane sugar, but if you can find piloncillo, use that). Note: I originally posted a larger amount of sugar, but after experimenting some more, I prefer it with less sugar. The yeast for fermentation is on the rind, so you don't want to scrub it clean, just rinse it off. Cut up the rind so that it will fit it in the mason jar. Add the spices (if desired), sugar, and water. Some recipes suggest making a syrup with the sugar, water, and spices first - by heating them in a pan until the sugar is dissolved. Let the syrup cool completely before adding it to the pineapple rinds. I just added the sugar and water. I didn’t even stir the mixture, and by day two all of the sugar was dissolved. Either method will work. Cover the brew with a metal ring and cloth, or a lid to keep the ants out. Let the brew sit out for 24 to 48 hours. If the room is cool, it may take up to a week to get to the bubbling stage. After a day of fermenting, monitor it very closely. It should smell like deep, rich pineapple. If it smells like ham or bologna, discard - it is full of bad microbes. Once the tepache starts to bubble, keep tasting until it tastes like fruity, bubbly, zesty pineapple. It should be bubbly, but not smell or taste like vinegar. If necessary, put it in the fridge to slow down fermentation because it can quickly turn to vinegar. If it does turn to vinegar, don't fret, because you just made pineapple vinegar, and your salads will be tasty. When it is ready, strain the tepache into a bottle or another mason jar. I like to let it sit in the fridge for another day to chill and improve the flavor. Don’t toss the rinds! You can try to get a second batch of tepache by repeating the process with the same rinds. I didn’t have success extracting a second batch, but I will try again with my next pineapple. Some folks add a can of beer after the first day of fermentation to speed up the process and add flavor. Try adding a couple pieces of charred or grilled pineapple. Or a chipotle or ancho chile. My favorite way to enjoy tepache is on ice. It is a low alcohol soda, much like kombucha, but not sour. It is the perfect thing to drink when it is unbearably hot. You can also add a a few leaves of fresh basil or pineapple sage to your glass. Delicious! Mix with beer or hard cider. The suggested ratio is usually 2/3rds tepache to 1/3rd beer, but I like to reverse the ratio. Try mixing with Mexican lager, IPA, wit, saison, or hefeweizen. Mix with cocktails. So far I have tried tepache with rum, tequila, and mezcal, all with great success. The earthy and effervescent pineapple brew plays nicely in a cocktail. Serket is the goddess of healing venomous stings in Egyptian mythology. Basil is said to attract scorpions, and, if consumed, to ease the pain of their sting. This cup is an offering to Serket. I hope she likes tequila. In a cocktail shaker or mason jar, muddle the basil leaves with the lime and simple syrup. Add the tequila, mezcal, and some ice. Shake well. Add the tepache and stir well (shaking tepache is not a good idea - it really bubbles over). Strain and serve on the rocks. I garnished ours with a plump Chester blackberry. Reserve the fruit for eating and Pina Coladas. We drink the juice. Place the rinds in a jar; add a cinnamon stick and allspice, if desired. Add two cups of sugar to the jar. I added muscovado and cane sugar. I strained this batch after three days of fermentation. It may only take a day or two, but watch it closely, or it will turn to vinegar.